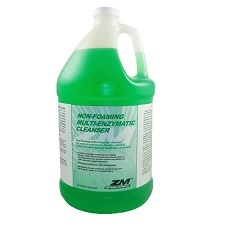 Zutron Medical's Non-Foaming Multi-Enzymatic Cleanser is a triple enzymatic formula is specially formulated to be low foaming for manual cleaning that demands high visibility and automated processes that require low foaming cleansers. It effectively cleans away blood, proteins, fat and carbohydrates from surgical instruments, flexible and rigid scopes and other general health care equipment. The highly concentrated formula can be diluted at 1/2 ounce to 1 ounce per gallon of water.